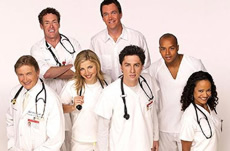 Though NBC cancelled Scrubs after seven seasons of mediocre ratings, the peacock network is apparently bitter that the sitcom is continuing over on ABC. According to EW, two actors who wanted to participate weren’t allowed to take part by their NBC boss — Heroes’ Masi Oka and Chuck’s Sarah Lancaster. 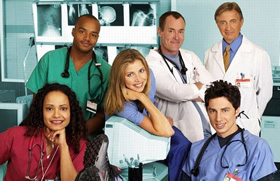 According to Scrubs creator Bill Lawrence, both actors wanted to be in the episode but NBC wouldn’t allow it. Lawrence has been quite vocal about NBC’s treatment of Scrubs while it was on NBC — lack of promotion and schedule hopping — and says this was a petty move by the network. Though the guest list isn’t as long as it could have been, reports are that the finale will still be a tear-jerker. Will this actually be the final episode or could the show continue for season nine? That would certainly irk the peacock execs! 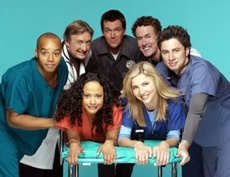 ABC has maintained that there’s a chance Scrubs could return for a ninth year if the new season performs well. Unfortunately for fans of the sitcom, several key people have stated that they won’t be part of it. Series star Zach Braff is leaving for sure and Lawrence says that he plans to move on as well. Judy Reyes (Nurse Carla) has said that she’ll be leaving too and hopes to segue to feature films and a role on Broadway. Season eight will introduce a few new intern characters into the cast. Will ABC’s commitment to the show attract a bigger audience than NBC could? Could ABC’s 2009-10 schedule feature Scrubs: The Next Generation? Stay tuned! Have to agree with Bill Lawrence here, this is “petty” indeed. I guess NBC figured since they screwed up the ending of the series on their network by airing episodes out of order, why not try and do it again on another network.